A great team achievement and another success story for an Agile SharePoint project. 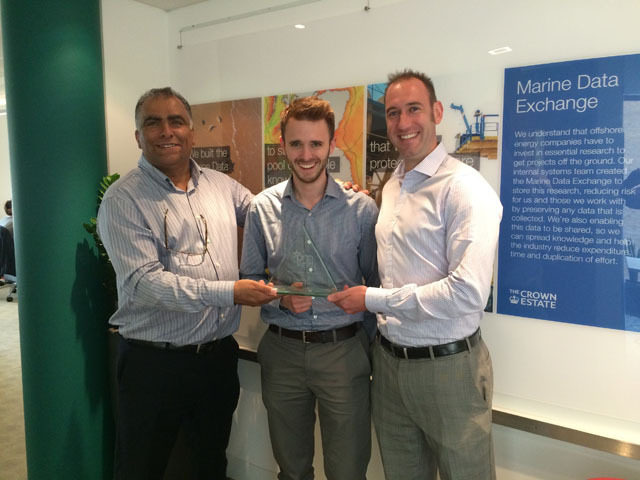 The Crown Estate’s Renewable Energy Project Marine Data Exchange (MDE) collected the Project of the Year – Gold Award at the 2013 Document Manager magazine DM Awards in London. Agilistix CEO, Carl Adamson, the Agile Scrum Master and Solutions Architect for Marine Data Exchange, pictured above with team members Peter Edmonds (middle) and Chris Boyce (right) posed for the camera at The Crown Estate’s Head Office in Regent Street. “It may sound cliché but the truth is, everyone was working together, not as individuals but as one team to produce an amazing product”, Adamson said. Other camera-shy but greatly valued team members, missing from the above photograph, include: Rod McLean, Eneko Vallecillo of and Miguel Costa, both from technology partner, ClearPeople. Marine Data Exchange is a pioneering and highly complex Big Data project, treading technical ground that had not been trodden before, by using Microsoft SharePoint to store and manage up to 1PB (1,000 terabytes) of marine survey reports and data. Portions of this data were then made available, in the cloud, with Windows Azure, to businesses and other interested parties.